The BC Tourism Industry Awards recognize excellence in the province’s tourism industry. Recipients provide outstanding service, exemplify best business practices, innovative marketing and deliver tourism experiences that contribute to the success of BC’s tourism industry – which currently generates $14.6 billion in revenue for the province’s economy. Congratulations to all the amazing nominees for this year’s BC Tourism Industry Awards! Here are the winners and finalists in each category. And the winner… Island Lake Lodge! And the winner… Bram Bolwijn, Mission Hill Family Estate Winery! And the winner… Fairmont Hotels for their World Class Wild Campaign! Remarkable Experience Award, sponsored by Destination Think! This award recognizes a British Columbia tourism business or organization that has developed, delivered, promoted and sold a new or improved tourism product or experience that reflects the essence of British Columbia and contributes to a remarkable visitor experience. Festivals/events, adventure/outdoor, food and beverage, cultural/ heritage, urban/rural and accommodation experiences may all be considered within this category. And the winner… Spirit of the West Adventures! 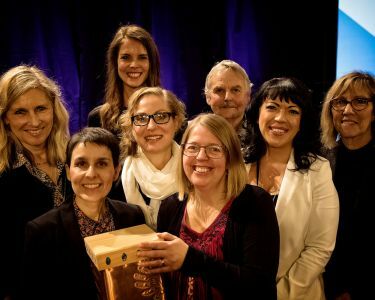 Recognizes community DMOs for outstanding performance, accountability and commitment to the tourism industry in British Columbia. And the winner… Tourism Chilliwack!